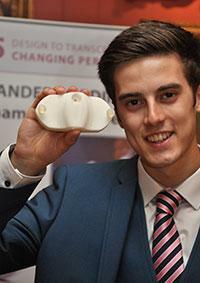 DESIGN INNOVATION IN PLASTICS _ STUDENT DESIGN AWARD. 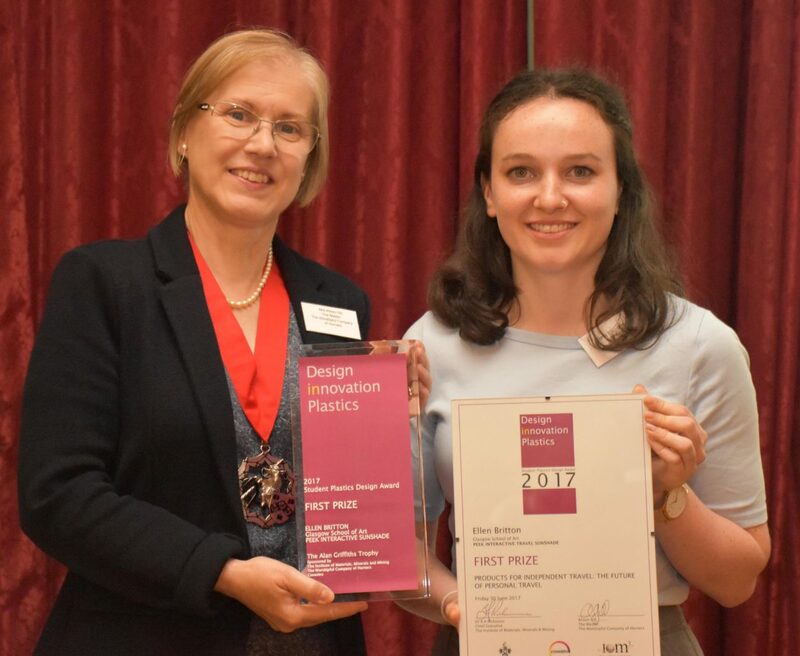 This year the first prize was awarded to Ellen Britton, a Year 4 Product Design Engineering student at Glasgow School of Art. 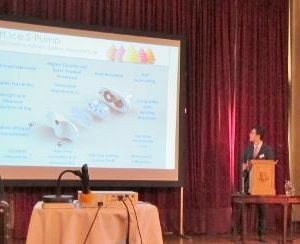 The competition brief, ‘Products for Independent Travel,’ had challenged students to design an innovative product, primarily in plastic, that will provide a more comfortable and less stressful travel experience. 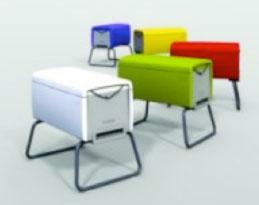 Entries ranged from beach skis for wheelchairs and modular backpack systems to shower boxes. Ellen designed a new product called ‘Peek’, an interactive travel sunshade, which uses smart technology, allowing children to use their imagination to create pictures, while still capturing glimpses of the big outdoors through a car or train window. 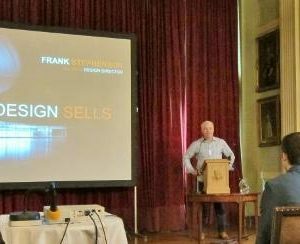 Theme: Products For Pets – Design For Animal Wellbeing. 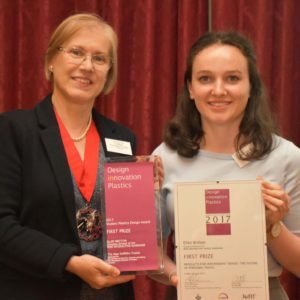 The winner in 2016 is Annabel Burton, a second year student at Nottingham University who re-designed the buckle that fastens around the girth of a horse to hold its rug in place. It is a quick release device moulded in thermoplastic polyurethane. 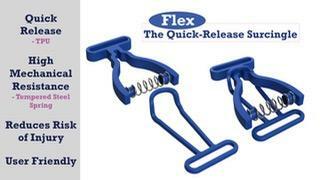 Its quick release prevents injury when the horse’s leg gets caught in the strap. 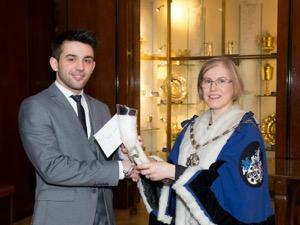 The winner, Alexander Bordino from Nottingham Trent University, designed the Soft Ice S Pump – a redesign of the stainless steel pump fitted to soft ice cream machines. TickleFlex is an insulin injection aid for diabetics. 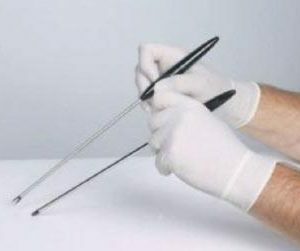 It fits over the disposable needle used by insulin pens and makes the act of self injecting safer, easier and more comfortable. 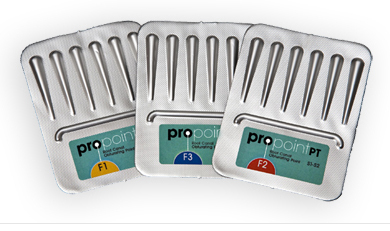 The product features a silicon flexure that collapses in a controlled way when pressed against the skin. 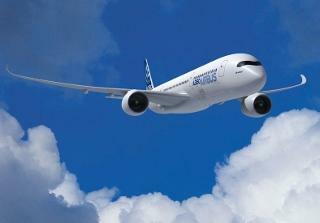 It then delivers multi-function benefits. The world’s first all-plastic trumpet has won the Horners Award for Plastics Innovation and Design 2016. 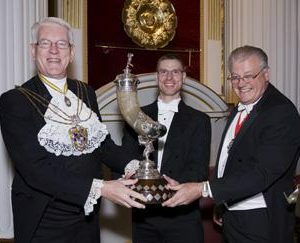 Designed by musicians in England and produced by Warwick Music Group, the pTrumpet was praised by the judges for the fact that it made the trumpet an affordable instrument for many — especially school children. 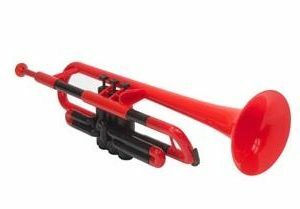 The pTrumpet is made up of a fully plastic valve system — the first of its kind — with self-lubricating plastic properties. The polymer lead pipe technology is unique, as is the ability to manufacture the lead pipe in one unit. 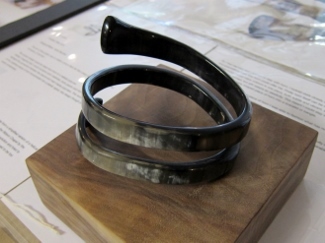 The judges selected the Thermochromic Cable Collar by GH Innovation Ltd as the runner-up. It is a brand new electrical fire safety product that highlights high temperature or loose electrical connections by changing colour. 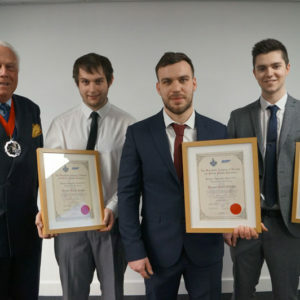 It was commended for its potentially lifesaving properties, as one of the main causes of electrical fires in homes and businesses are overheated electrical connections. 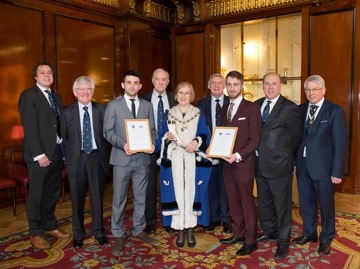 Guardian Maritime Limited are the winners of the 2015 Horners Award for Plastics Design and Innovation. Piracy at sea has been a problem for hundreds of years. In recent years, piracy has extended far off the Somali coast, into the Indian Ocean and is now escalating on the West Coast of Africa, Indonesia and Central America. Guardian Maritime Limited developed a new and deceptively simple solution to the problem of unwanted boarding under sail, at anchor or in port. Unlike razor wire, the GUARDIAN™ units are quick, simple and safe to install. They are rotationally moulded in 1000mm wide sections that lock together – clamping onto the safety rail to provide a strong and rigid structure. 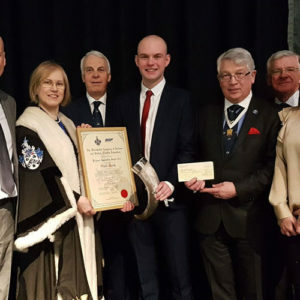 Teresa Stevens, Owner and Designer of GUARDIAN said “I am very proud to have been chosen for this award, being recognised by such an esteemed guild is a great honour. I would like to thank all those who have helped with the development of GUARDIAN including Paul Norman Plastics who guided me to the BPF website. 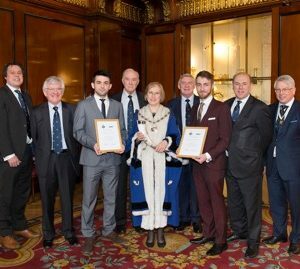 The award was presented at Mansion House, by Guest of Honour Alderman Sir Michael Bear who acted as Lord Mayor Locum Tenens. 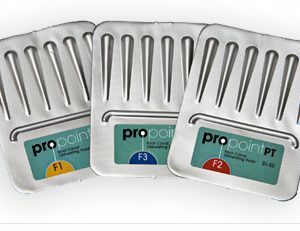 Propoints were designed to replace existing materials and some techniques, which can cause damage to the tooth and increase the chances of reinfections. For example, Propoints are a single-cone obturator, and so only one Propoint is required per tooth, unlike multi-cone lateral compaction techniques which a) create potential voids within the canal increasing chances of reinfection and b) result in lateral compaction which can potentially cause root fracture through the forces exerted. The highly innovative ‘Airbus A350 XWB Composite Rear Spar’, developed by GKN Aerospace, has been announced as the winner of the Horners Award for Plastics Design and Innovation 2013. 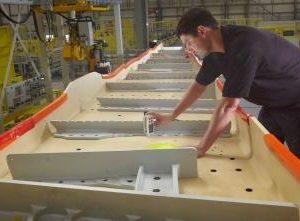 GKN Aerospace has developed automated processes for its A350 XWB composite spar and fixed trailing edge assembly programme. 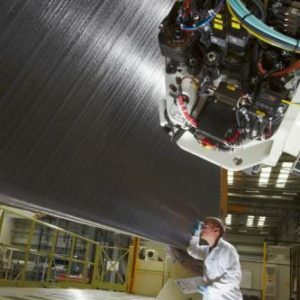 The application of state-of-the-art automated fibre placement (AFP) technology, unique to the UK, has allowed GKN Aerospace to produce cost effective repeatable lightweight components with more complex and bespoke geometries. 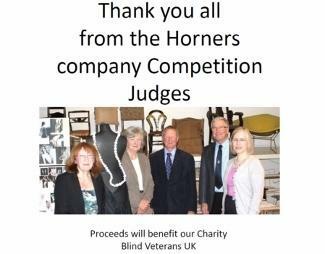 This year the Horners Award Committee was again impressed by the level of entries covering innovative products and processes. 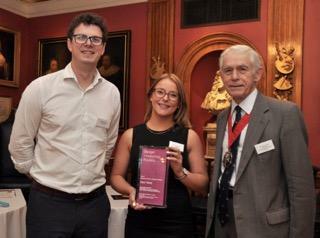 The Committee awarded the Horners’ Runner-Up Award to Hozelock for their ‘Growbag Waterer’, a device that keeps a grow bag watered for up to 2 weeks at a time. The grow bag is placed on a reservoir that incorporates specially designed spikes that pierce the bottom of the grow bag. One of its greatest benefits it that it prevents water wastage and helps people produce local grown food with improved success. 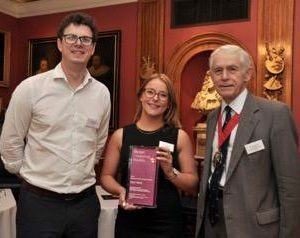 The judges were also delighted to nominate three other products for the Highly Commended Certificate as follows: ‘The Chest Drain Trainer’ by Limbs & Things Ltd, Emerald Automotive’s ‘Thermoplastic Composite Bodied Electric Vehicle’ and ‘Temporary Industrial Roadway’ designed by Big Bear Plastics. 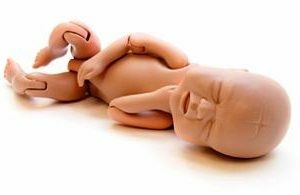 The Birthing Baby is a new born baby mannequin which is having a growing role in the training of doctors, midwives and nurses and helps to prevent adverse outcomes in childbirth. Training using The Birthing Baby helps eliminate confusion in roles and responsibilities, provides better structure and coordination to the performance of key clinical tasks and improves organization and support. The head, body and limbs are made from RTV Silicone rubber, ABS and water blown polyurethane foam. It includes several realistic, key anatomical features. The head is suitable to practice forceps and suction deliveries and the arms, legs and head articulate realistically. The flexibility, hardness, density and weight distribution of the skin, limbs and joints closely replicate those of a real baby. The secure bicycle storage system from Cycloc Product Design. The innovative mouldings allow cycles to be secured on a wall, optimising available space in offices and student accommodation. The mouldings are brightly coloured and exploit the design opportunities of the plastic materials chosen. The ‘Easy Clean’ Bedside Cabinet from Bristol Maid™ was designed to assist in reducing unwanted healthcare associated infections. 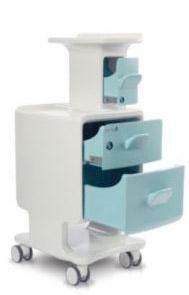 The design reduces the number of hard to reach corners and surfaces without cutting down patient storage. The rotationally moulded design helps to achieve better standards of hygiene in patient care whilst maximising space, security and flexibility in operation. The Beehaus was developed using modern plastics materials to provide bees with a safe, modern home in which to live and makes beekeeping straightforward and fun. The judges were greatly impressed by the Omlet Beehaus due to its use of plastics materials to benefit the environment and to address a topical issue, the decline in bee populations. 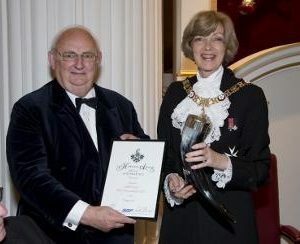 Omlet is the first com-pany in the history of the Horners Award to have won twice, having received the Award in 2004 for their ‘Eglu’ Chicken Coop. A revolutionary, lightweight and environmentally friendly kerbstone system.The overall design concept of the ‘Durakerb’ system which is manufactured from a blend of recycled polymers, aims to help specifiers and contractors comply with Government requirements for sustainable buildings. Durakerb is a cost-effective solution not only to the Health & Safety Executive’s Manual Handling Regulations but also to the ever increasing environmental performance targets now commonplace throughout the construction industry. 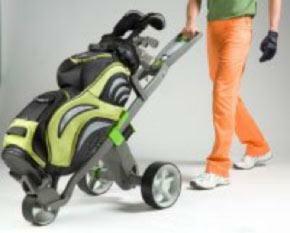 A thermoplastics, injection-moulded, powered Golf Trolley. The Golf Trolley has been designed by Greaves Best Design and is manufactured by GoKart Powered Golf. 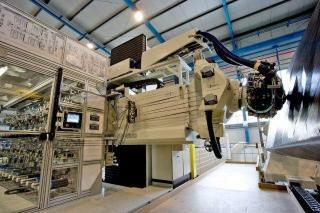 Tooling, moulding and component sourcing is accessed through DT Industries. 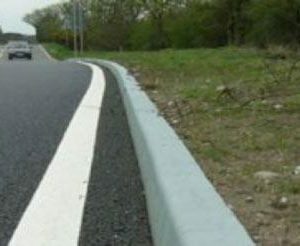 Plastics materials are used to great effect in producing an extremely durable, light weight and low maintenance product which is easily manoeuvrable at all elevations and on golf courses with challenging terrains. The materials selected facilitated innovation in the incorporation of springs, hinges, gears, and integral latches. 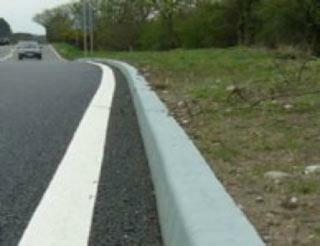 Tactile qualities could be introduced which enhanced comfort and allowed a firm grip. 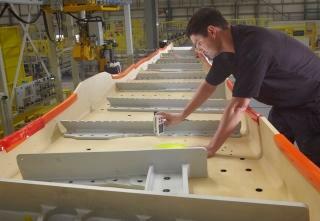 Over- all, as the components were moulded, the number of parts could be reduced with cost savings resulting. 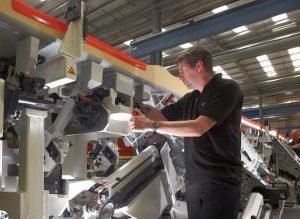 Sovrin Plastics was the winner of the 2006 Horners Award. Sovrin received the honor for the ‘Syclix’ surgical instruments for minimally invasive surgery. 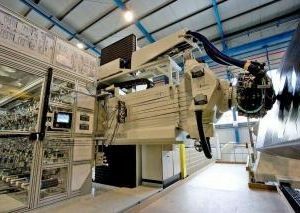 The company was recruited to build the tooling for the Syclix device as well as mould and assemble the product. 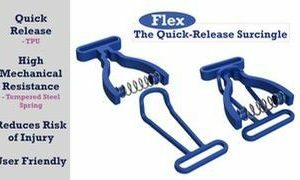 The ‘Syclix’ recognises innovation in plastics, in its elimination of the ring grip on regular surgical in- struments, which can be restricting and tiring for surgeons. 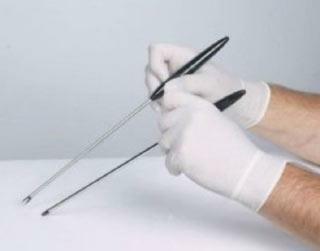 Through rolling the instrument with the forefinger and thumb, the jaws of the instrument are controlled with minimal arm movement for 180 degree rotation. 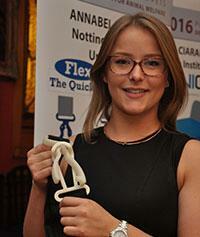 The UltraCane is an inventive mobility aid for the blind and partially sighted. It works exactly the same way that bats “see” using ultrasonic echoes to provide users with the ability to “feel” objects in their environment through the cane’s vibrations. Like the bat, the Ultracane uses ultrasonic echoes (signals that bounce off objects in the vicinity) to detect how big and how far ahead obstacles are and converts this information into vibrating but- tons in its handle. As there are a number of sensors, the can can even detect ob- structions at head height. This means that the UltraCane user builds a growing spatial map of their surroundings and all the trials and user feedback suggests that this spatial awareness doesn’t even require conscious effort on behalf of the user – it just happens. The additional feelings of safety and confidence reported by users is no doubt because blind and vision- impaired people have been used extensively in developing the UltraCane. 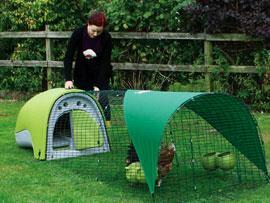 The EGLU Chicken coop was adapted to accommodate other small animals such as rabbits and hamsters. Seven of the struc- tural components are rotationally moulded by HP Mouldings in HPDE in a range of elegant colours. 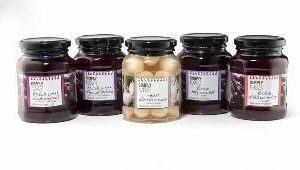 It can be delivered direct to your home, together with a pair of hens and enough food to start them laying eggs. 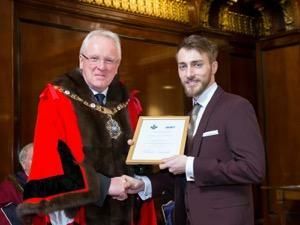 One of this year’s most outstanding entries and the ultimate winner was the Vent-Axia® Air Minder. This whole-house heat recovery ventilation system effortlessly removes the home’s polluted air. 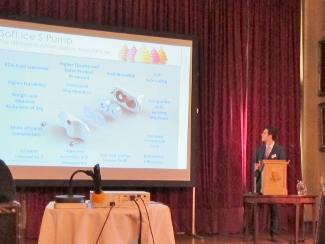 The main unit had to be light in weight in order to ease installation and plastics became the first choice material. Two ground-breaking design features were developed, firstly the major ABS outer casings were over moulded with expanded polystyrene in order to ease the air flow and improve the insulation and quiet running of the unit and secondly, the traditional bulky aluminium heat exchanger was replaced by an automatically assembled series of concatenated thermoformed PVC baffle plates which now outstrip the performance of metal equivalents. The Air Minder can greatly reduce the energy needed to heat the home and will have a positive environmental impact when installed in new buildings. A new innovative system for mixing and preparing refinish material prior to spraying. This system features a plastic disposable reservoir and associated fittings which greatly improve the efficiency of the spraying system. The World’s first single piece PET can entered by the RPC Containers Ltd. 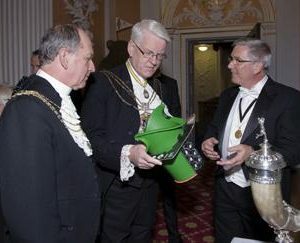 Judges chose the plastic can because it has revolutionised the way lever-lid containers can be produced and con- quered the limitations posed by current moulding techniques. ‘Inventa’ – an innovative education aid entered by Valiant Technology Limited which makes extensive use of injec- tion moulded Polystyrene and Polypropylene parts. A new concept design for a 60 litre Supermarket Shopping Trolley which was developed by a consortium including the Industrial Design Consultancy (based in Slough), Dupont Engineering Polymers (based in Hemel Hempstead), Plasto AS (Norway) and Carte 2000 (Australia). First Editions Ltd have developed an innovative technology that enables digital print to be applied directly to a bottle’s surface. 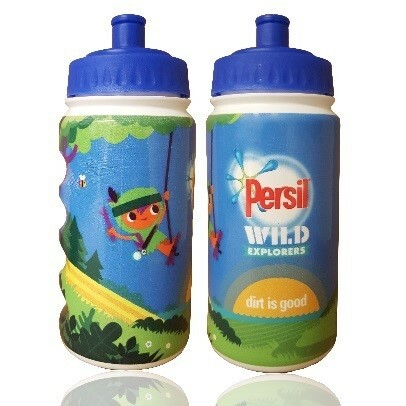 The process transforms the UK manufactured 100% LDPE bottles from a traditional sports bottle to something unique. 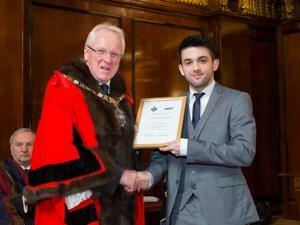 More information on this award can be found on the BPF Website here. The ICE Bottle by R&D Tool and Engineering Ltd won the 2016 award. 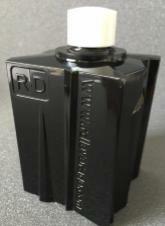 Initially created for the cosmetics market, the glass-like bottle is produced using injection stretch blow moulding. The result is a stackable bottle with a sleek high-end almost architectural look. It was praised by the judges for the way it demonstrates what is possible with plastics at the premium end of the market and for its unique eye-catching design. 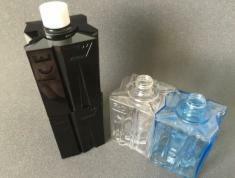 Made from a copolyester supplied by Eastman, the square shoulders of the bottle also allow for a simple engraving process that can be easily read. It has sparked interest from many parts of the polyethylene terephthalate (PET) industry. The innovative new 1.5 litre bottle design was developed to save about 2.500 tons of plastic each year to reduce waste and help the environment. The bottle is produced from recycled PET and the design uses biomimicry, strengthening the base with a honeycomb rib configuration to withstand up to 1bar of internal pressure due to the Nitrogen applied during filling. The bottle was launched in May 2015. The winner of the 2014 Bottlemakers Award was judged to be the Braille Tubes by M&H Plastics. The Braille Tubes demonstrates excellence in design and innovation. 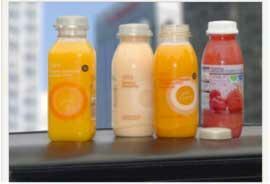 M&H has developed a method of accurately printing Braille characters directly onto plastic packaging. A high-build varnish is used to print the dots directly onto the product using extremely accurate measures to ensure the height of the Braille alphabet remains uniform throughout the packaging run. 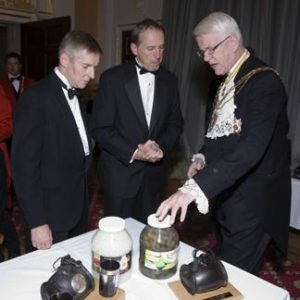 APPE’s ThermaLite® Hot-fill, Pasteuriseable PET Jar has been confirmed as the winner of the Horners Bottlemaker Award 2013. The ThermaLite® PET jars demonstrates excellence in design and innovation. The jars are able to hot-fill at temperatures to 95 °C (previous industry maximum was 85 °C) and be pasteurised (previously not achievable with PET which is a global first). 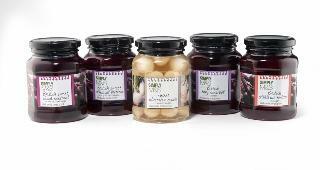 Using a revolutionary double-blow manufacturing process and specialist PET resin, APPE have produced jars that are fully transparent, high gloss and shatterproof. 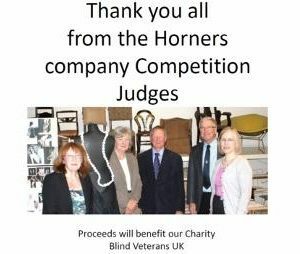 The Horners Award Committee were also impressed by the products excellent environmental advantages. 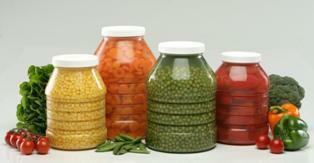 The jars are 85% lighter with smaller footprint than glass equivalents and require 15% less food-processing energy. The winner of the 2012 Bottlemakers Award is the Ecotainer from RPC Plenmeller. Judged to show great advance in the design of anti ‘glug’ pouring, the container optimised space, combining light weight with positive safe stacking. 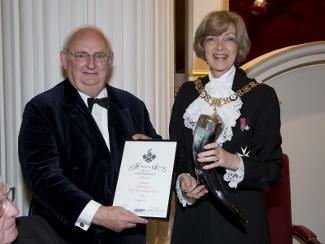 The Bottlemakers Award this year was won by RPC Group and presented to Michael Stegeman. Their ‘retortable jar’ allows the hot filling of bulk food catering packs without the associated problems of expansion and distortion. The design incorporates novel ribbing to maintain shape during filling. 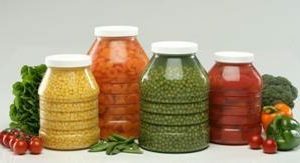 As a glass replacement, the jars reduce weight and add safety. 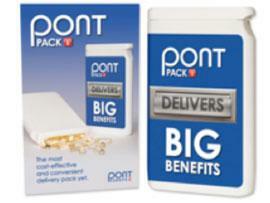 The 2010 winner of the Bottlemakers Award was judged to be the RPC Vitamin Postal Pack. RPC blow-moulded the HDPE bottle that needed to be less than 25mm deep in order to fit into the parameters of a standard letter. A polypropylene oblong cap to fit securely onto the pack and the bottleneck is induction sealed for air-tightness and tamper evidence. 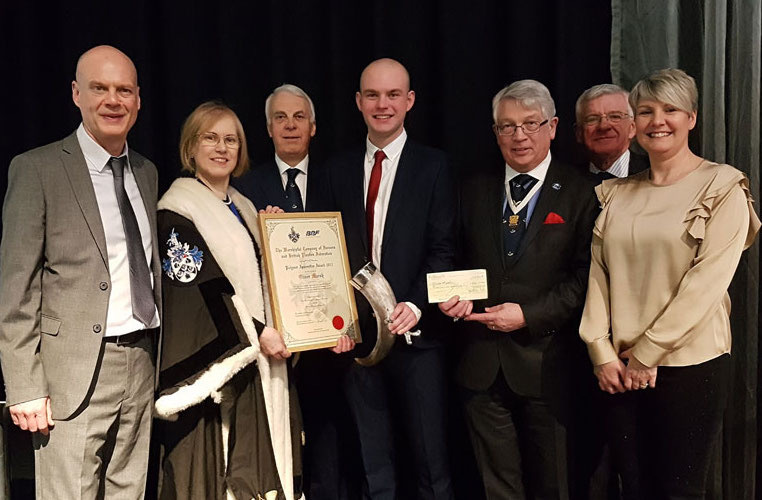 NEMESIS range of bottlesThe Horner’s Bottlemaking Award, sponsored by the Polymer Machinery Manufacturers & Distributors Association , has been won by Northumbria Blow Mouldings Ltd for their NEMESIS range of bottles. 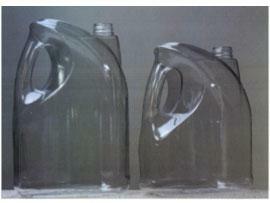 Available in 1, 2.5, 4 and 5 litre sizes, the bottles are extrusion blow moulded from a modified PET. 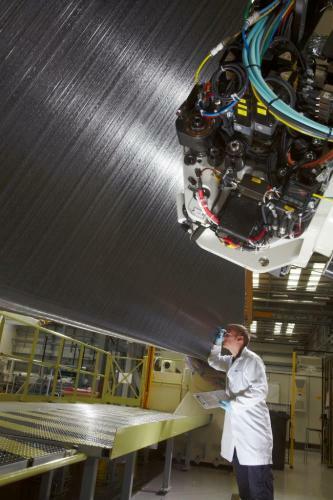 This represents a technological breakthrough for blow mouldings of this size in a material that is both clear and fully recyclable, whilst having excellent gas barrier properties. 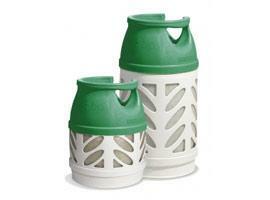 Ragasco AS for the BP Gas Light, the lightweight composite gas cylinder. 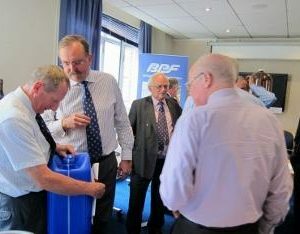 Developed and manufactured by Ragasco in Norway and sold in the UK through BP, this unique lightweight composite gas cylinder was a clear winner with the judges. 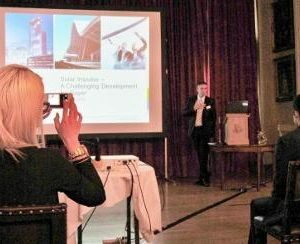 The innovative use of multiple materials to replace the traditional steel bottles was re- garded as a great achievement and it was agreed that this development extends the scope of blow moulding into a new area of application. 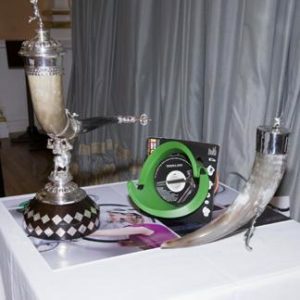 The pleasing design and enhanced user-friendly features such as reduced weight, easy to see gas level, non-corrosive and non-explosive all added to it being selected as the 2007 winner. 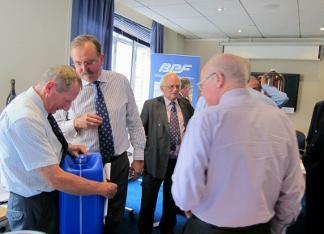 DR. FROHN designed 20 litre ‘Monty’ plastic canister for BP. Developed by DR.ING.W.FROHN GMBH & CO KG in partnership with BP and manufactured by Werit UK Limited, the Monty pack is a lightweight, stackable, plastic retail container which allows automated high speed filling with a unique patented “ECOVENT” anti-glug discharge feature. Moulded in HDPE, the Ecovent Discharge System vents through a channel running beneath and through the handle. This minimises potentially dangerous splashing of contents, drastically reduces emptying time, and improves pouring accuracy. 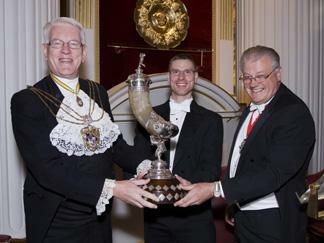 In 2005 the judging panel decided to give the Award not for a bottle or container of unique design but for a manufacturing process. 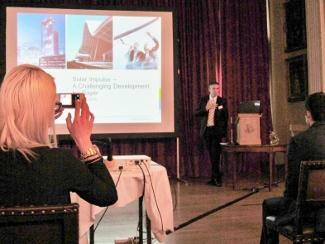 The trophy was presented to the RPC Group plc for their new, transparent, injection stretch-blown bottles. These screw-top containers are made using 30% post consumer recycled PET. In 2003 the judging panel selected the “LIMELITE” extrusion blow-moulded one-piece, dual chamber bottle , incorporating two corresponding necks made from polypropylene, together with its injection-moulded adaptor and cap. It features the containment and pouring of two chemically different liquids which are not allowed to have contact during storage; they give common effect when flowing together after pouring. 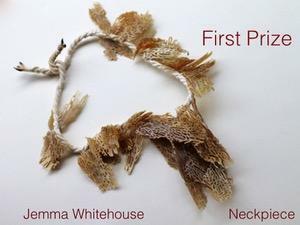 First prize was awarded to Jemma Whitehouse for her horn coral neckpiece. 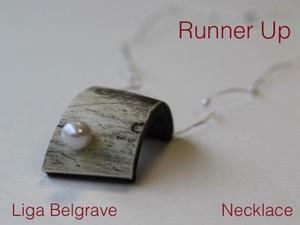 The Runner up was Liga Belgrave for her Horn necklace. 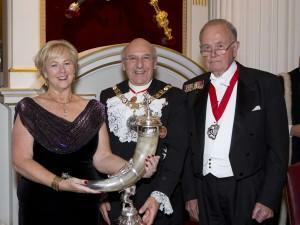 The winner’s neckpiece was auctioned in aid of the Master’s Charity in June at the Horners Charity Evening event at Painter Stainer’s Hall to which Jemma was a guest. 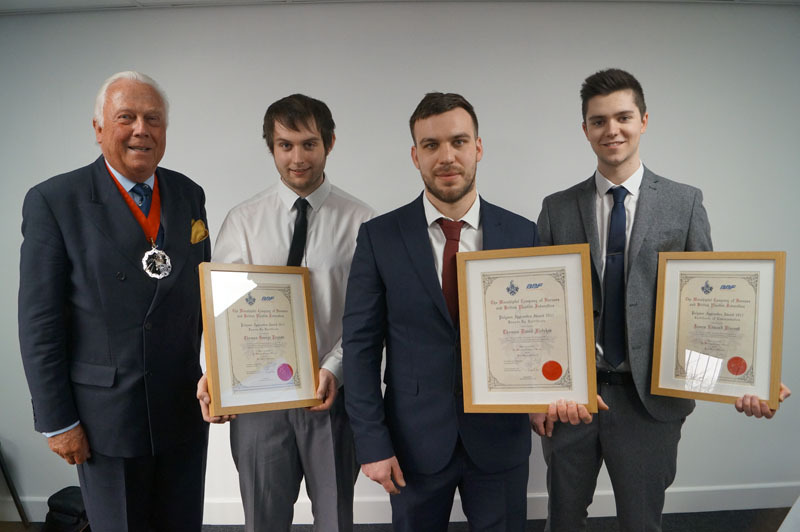 The 2015 Award entries were of a very high standard and showed remarkable talent. 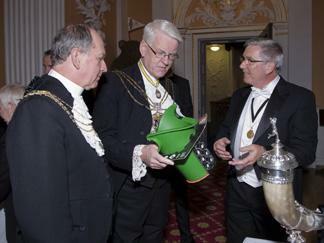 The best judged entries were submitted for auction at the Master’s Charity Dinner. 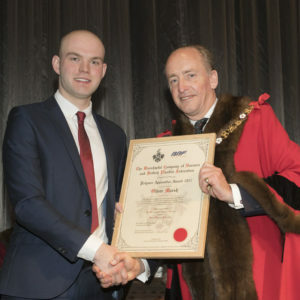 The first prize was awarded to to Oliver Marsh of MGB Plastics (Britain’s largest manufacturer of wheelie bins), whose exceptional achievement the panel also adjudged to deserve the award of a Polymer Apprentice Certificate under the conditions of the Livery Skills Council Apprentice Certificate Scheme. 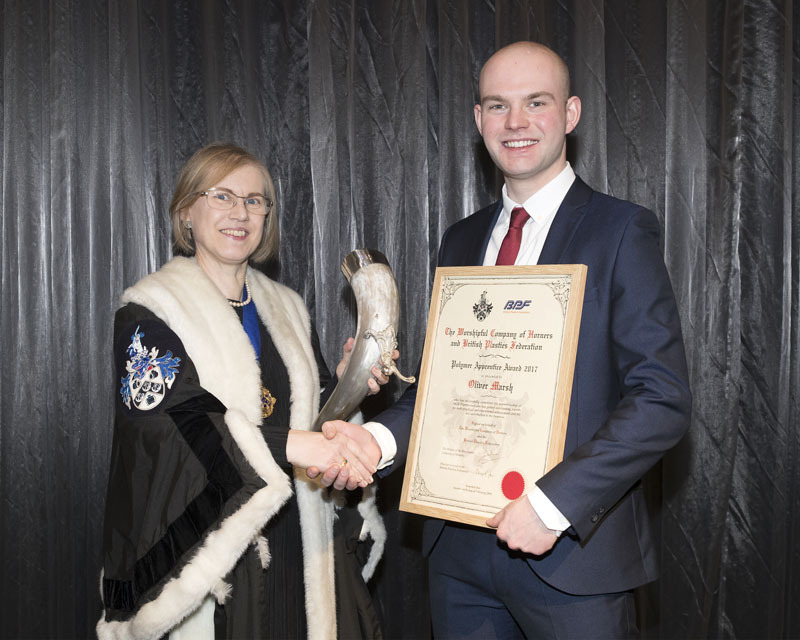 Oliver demonstrated a high level of achievement in completing parallel apprenticeships in Mechanical Engineering (with Distinction) and Plastics Processing. 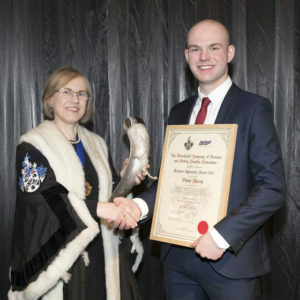 However, he made the biggest impression with his leadership role in the numerous improvement projects which he undertook, showing great ingenuity, the most important being the engineering of improvements to a high-technology process, which reduced changeover time to a fraction of that previously achieved, providing very substantial cost savings. Out of work, Oliver plays in a rock band and has developed a taste for sailing. 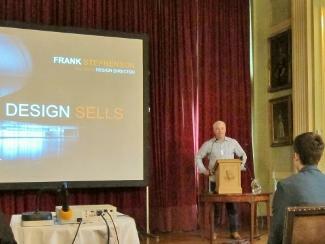 The judges awarded runner-up prizes (of £200) to two other candidates, considered to be to be of an excellent standard. 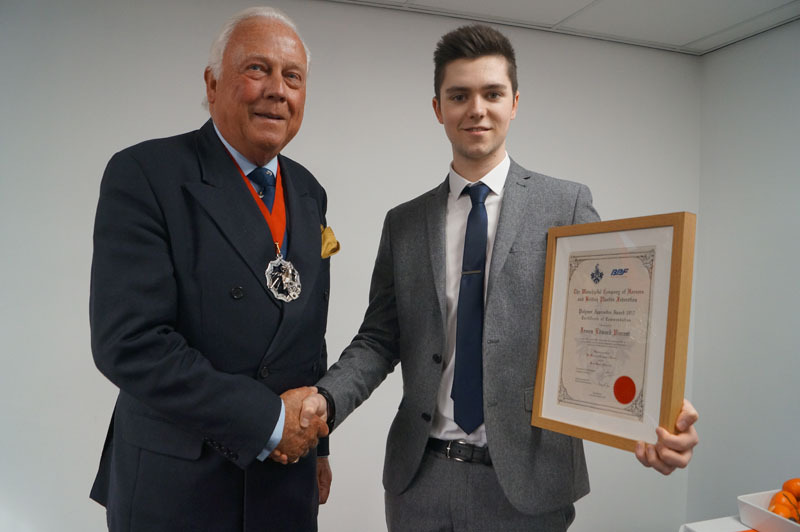 Tom Fletcher served his apprenticeship in engineering at Polypipe Civils, manufacturers of plastic piping systems. 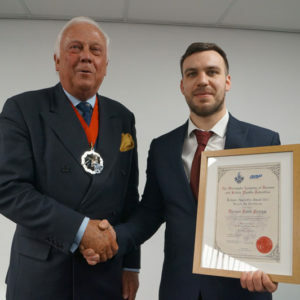 Although already in employment he sought the challenge and career potential of an apprenticeship, during which, with great determination, he learnt new disciplines, instigated and completed new projects and helped to develop the newer apprentices. He has now been given primary responsibility for the maintenance of a new factory. Tom Rayson is serving his engineering apprenticeship at RPC Containers Limited, Market Rasen, manufacturers of plastic packaging. 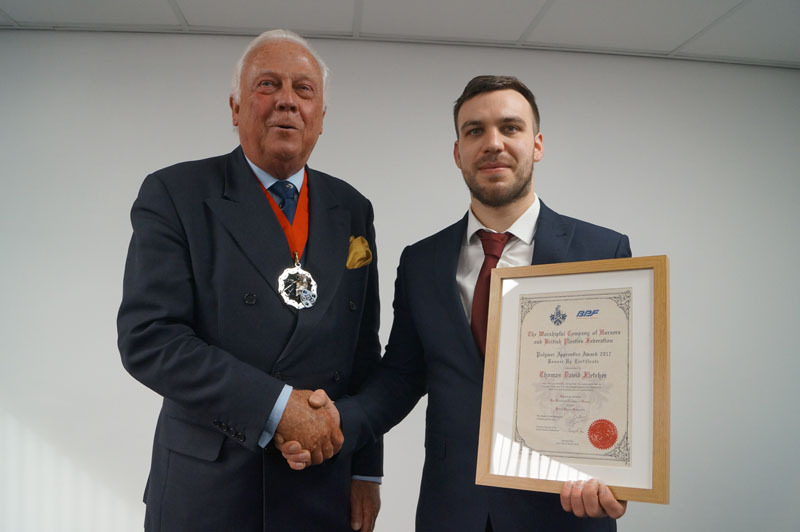 He has demonstrated professionalism and commitment in all the areas he has worked, and has shown good technical understanding and communication skills. He has designed a new piece of equipment for making engineering parts. 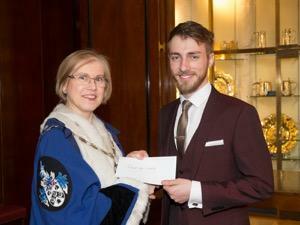 The 2016 winner was Reece Connolly who received a Presentation Horn and a Cheque for £500. 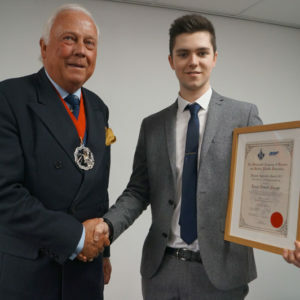 Reece completed a Level 3 apprenticeship in Process Operations at BASF, Bradford, a manufacturer of polymer based ingredients and processing aids. 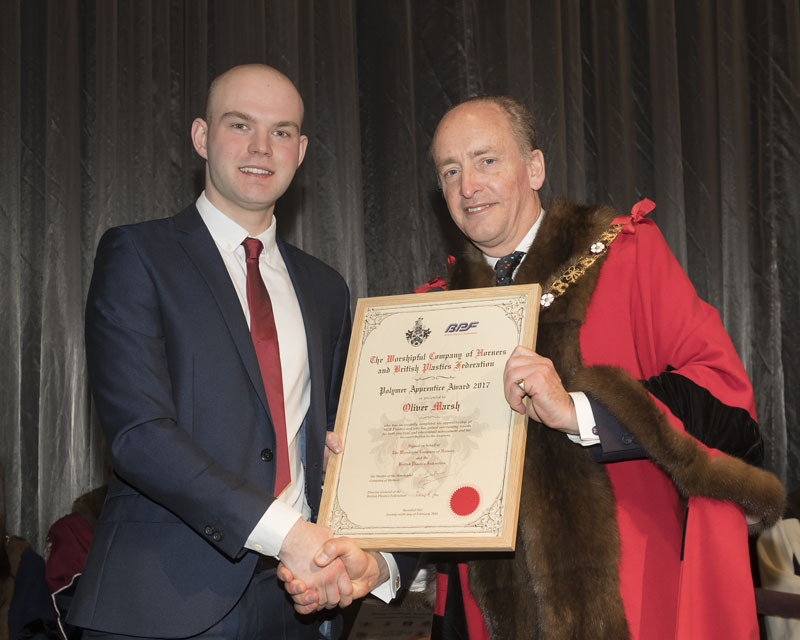 He was awarded the Salters City and Guilds prize for his performance in the Process Technology Level 3 course and was a key member of a team which developed a new plant performance display system which won a BASF global prize. 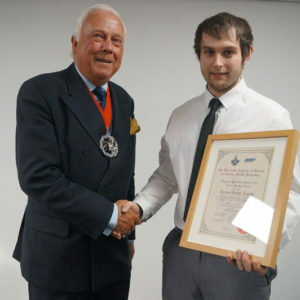 The runner-up was Robert Cummings who received a cheque for £200.Robert completed a four-year engineering apprenticeship at UCP Zeller, Norwich (part of the RPC Group) injection moulders of plastic closures. He is currently employed as a technician specializing in plant installation and maintenance and is studying for an HND in mechanical Engineering. 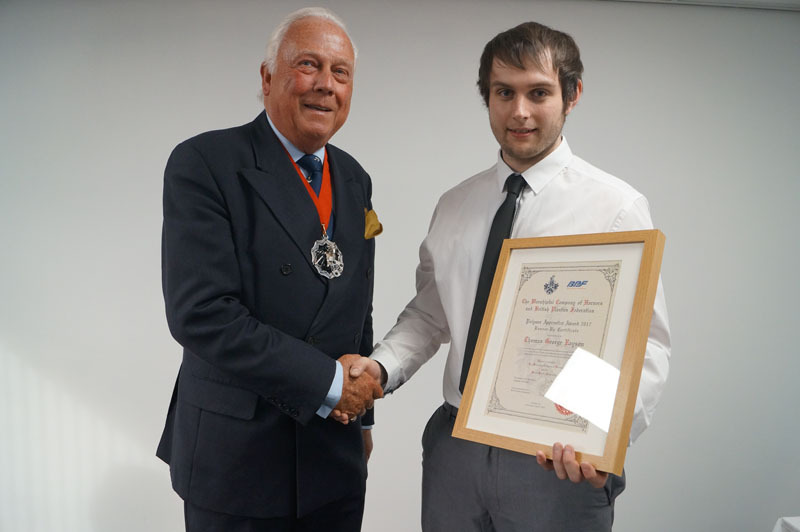 Kane Bentley of Amaray, Corby was awarded a Certificate of Commendation.